Much of the Sonoran Coast is low coastal plain, gradually sloping to a line of dunes, then an endless beach, or broken into a string of sandy barrier islands covered with mangroves, backed by a shallow lagoon. Such a coast is not the best paddling water. The endless beach sounds good, but it means you have to launch and land in surf. The mangrove/barrier island sections of the coast make for safer landings, but they are infested at dawn and dusk with clouds of sandflies and mosquitoes. And from the water, the landscape is flat and featureless. Broad beaches backed by low dunes make a picturesque picnic site, but getting in and out of the water can be hazardous. 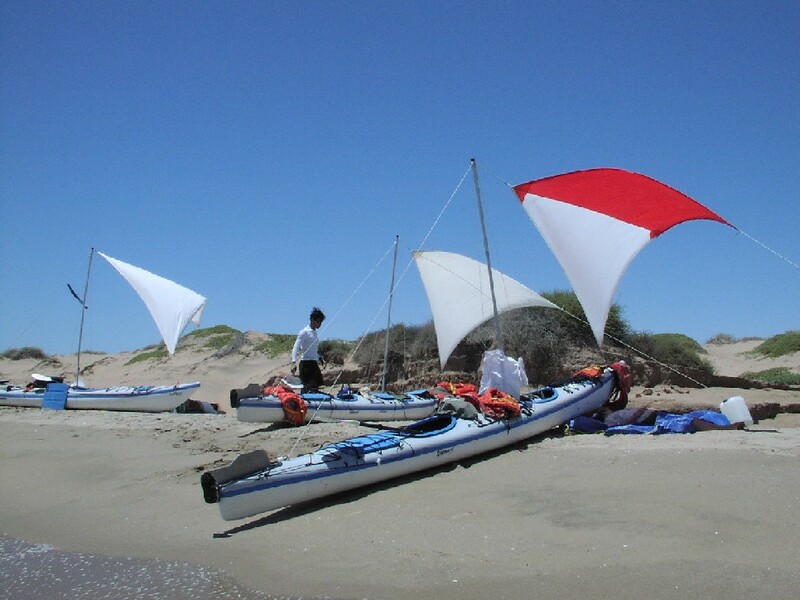 The sails are positioned for shade. But there is one stretch of coast where a range of low mountains runs right into the sea. Here the coast is jagged and rocky, with high headlands and deep, sheltered coves. 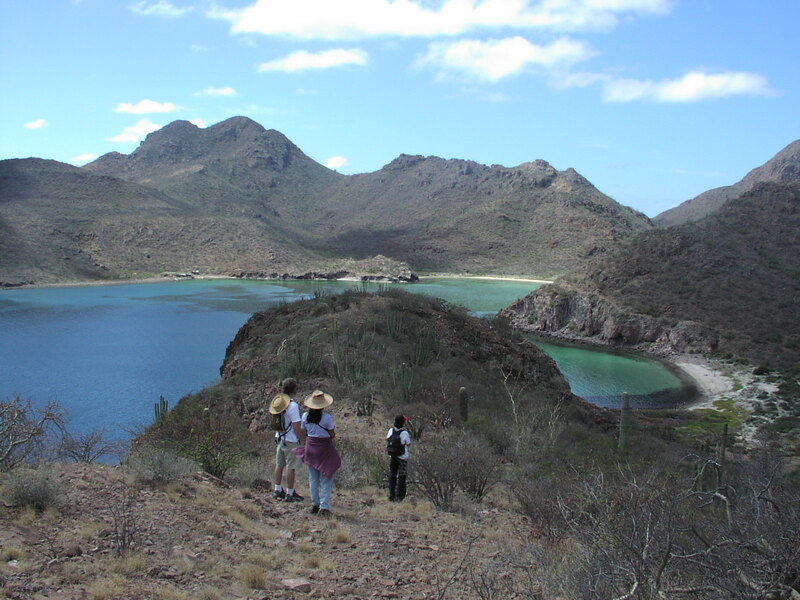 This range, called the Sierra el Aguaje, runs from just south of Guaymas, north through San Carlos to Tastiota, encompassing about 40 miles of coastline. Rocky headlands alternate with sheltered bays with sandy or gravelly beaches. Protection from surf means easy and safe launchings and landings. The rocky shore is good for fishing and snorkeling and for collecting dinner. It’s also a good place for a hike. This coast is much more interesting, from a distance, and up close. Poking our noses into one of the many caves. 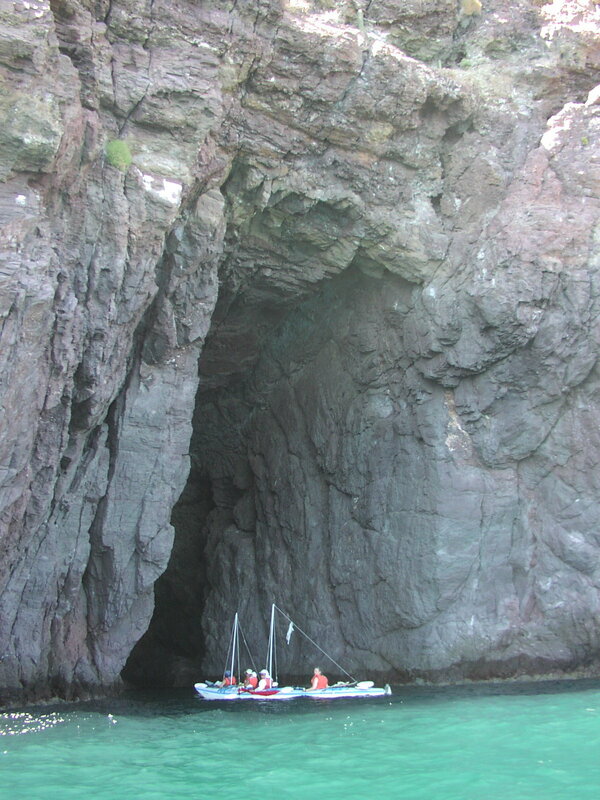 Swell-driven currents swirling around submerged rocks make manoeuvrng tricky as a pair of intrepid paddlers enter a sea cave. Kayaking is not blue-water sailing: we want to be among the reefs and shallow areas. Here, in the clear water, we can see schools of fish, watch birds diving for their dinner or resting on the cliffs, and playwith the waves and currents. 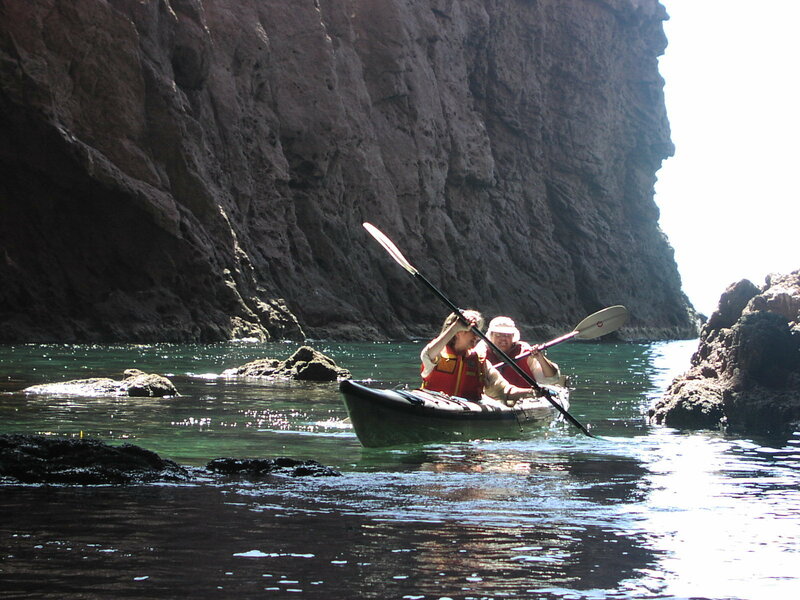 And the rocky coast of the Sierra el Aguaje is the best place in all of Sonora to get our blades wet and have some fun.